About half the population in the United States relies to some extent on groundwater as a source of drinking water, and still more use it to supply their factories with process water or their farms with irrigation water. However, if all water uses such as irrigation and power production are included, only about 25 percent of the water used nationally is derived from groundwater. Still, for those who rely on it, it is critical that their groundwater be unpolluted and relatively free of undesirable contaminants . A groundwater pollutant is any substance that, when it reaches an aquifer , makes the water unclean or otherwise unsuitable for a particular purpose. Sometimes the substance is a manufactured chemical, but just as often it might be microbial contamination. Contamination also can occur from naturally occurring mineral and metallic deposits in rock and soil. For many years, people believed that the soil and sediment layers deposited above an aquifer acted as a natural filter that kept many unnatural pollutants from the surface from infiltrating down to groundwater. By the 1970s, however, it became widely understood that those soil layers often did not adequately protect aquifers. Despite this realization, a significant amount of contamination already had been released to the nation's soil and groundwater. Scientists have since realized that once an aquifer becomes polluted, it may become unusable for decades, and is often impossible to clean up quickly and inexpensively. Groundwater pollution caused by human activities usually falls into one of two categories: point-source pollution and nonpoint-source pollution. Fertilizers and pesticides applied to crops eventually may reach underlying aquifers, particularly if the aquifer is shallow and not "protected" by an overlying layer of lowpermeability material, such as clay. 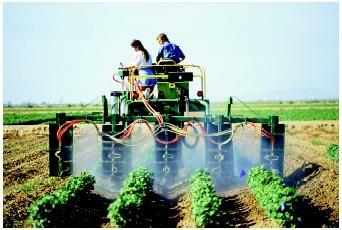 Drinking-water wells located close to cropland sometimes are contaminated by these agricultural chemicals. Point-source pollution refers to contamination originating from a single tank, disposal site, or facility. Industrial waste disposal sites, accidental spills, leaking gasoline storage tanks, and dumps or landfills are examples of point sources. Chemicals used in agriculture, such as fertilizers, pesticides , and herbicides are examples of nonpoint-source pollution because they are spread out across wide areas. Similarly, runoff from urban areas is a nonpoint source of pollution. Because nonpoint-source substances are used over large areas, they collectively can have a larger impact on the general quality of water in an aquifer than do point sources, particularly when these chemicals are used in areas that overlie aquifers that are vulnerable to pollution. If impacts from individual pollution sources such as septic system drain fields occur over large enough areas, they are often collectively treated as a nonpoint source of pollution. Some groundwater pollution occurs naturally. The toxic metal arsenic, for instance, is commonly found in the sediments or rock of the western United States, and can be present in groundwater at concentrations that exceed safe levels for drinking water. Radon gas is a radioactive product of the decay of naturally occurring uranium in the Earth's crust. Groundwater entering a house through a home water-supply system might release radon indoors where it could be breathed. One of the best known classes of groundwater contaminants includes petroleum-based fuels such as gasoline and diesel. Nationally, the U.S. Environmental Protection Agency (EPA) has recorded that there have been over 400,000 confirmed releases of petroleum-based fuels from leaking underground storage tanks. 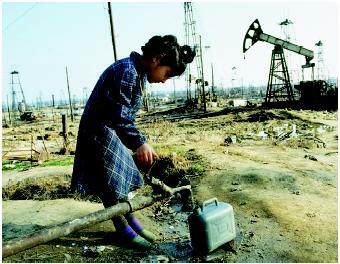 Aquifers in industrialized areas are at significant risk of being contaminated by chemicals and petroleum products. In most developed countries, various laws attempt to prevent land and water pollution, and to clean up contaminated areas when they occur. Developing countries and countries in economic distress are less likely than developed nations to assess the risk of groundwater contamination by land-use activities. cancer in humans but may be toxic in other ways. One interesting property of gasoline is that it is less dense than water, and so it tends to float on top of the water table . Another common class of groundwater contaminants includes chemicals known as chlorinated solvents. One example of a chlorinated solvent is dry-cleaning fluid, also known as perchloroethylene. These chemicals are similar to petroleum hydrocarbons in that they are made up of carbon and hydrogen atoms, but the molecules also have chlorine atoms in their structure. As a general rule, the chlorine present in chlorinated solvents makes this class of compounds more toxic than fuels. Unlike petroleum-based fuels, solvents are usually heavier than water, and thus tend to sink to the bottoms of aquifers. This makes solvent-contaminated aquifers much more difficult to clean up than those contaminated by fuels. Groundwater typically becomes polluted when rainfall soaks into the ground, comes in contact with buried waste or other sources of contamination, picks up chemicals, and carries them into groundwater. Sometimes the volume of a spill or leak is large enough that the chemical itself can reach groundwater without the help of infiltrating water. Groundwater tends to move very slowly and with little turbulence, dilution, or mixing. Therefore, once contaminants reach groundwater, they tend to form a concentrated plume that flows along with groundwater. Despite the slow movement of contamination through an aquifer, groundwater pollution often goes undetected for years, and as a result can spread over a large area. One chlorinated solvent plume in Arizona, for instance, is 0.8 kilometers (0.5 miles) wide and several kilometers long! Several federal laws focus on either preventing or remediating groundwater contamination, often caused by industrial, commercial, or petroleum pollutants. While these federal laws have provided an overall framework for these activities, the regulatory implementation of these laws is usually carried out by states in cooperation with local governments. Often, federal laws are adopted by the states largely unchanged. The two major federal laws that focus on remediating groundwater contamination include the Resource Conservation and Recovery Act (RCRA) and the Comprehensive Environmental Response, Compensation, and Liability Act (CERCLA), also known as Superfund. RCRA regulates storage, transportation, treatment, and disposal of solid and hazardous wastes, and emphasizes prevention of releases through management standards in addition to other waste management activities. CERCLA regulates the cleanup of abandoned waste sites or operating facilities that have contaminated soil or groundwater. CERCLA was amended in 1986 to include provisions authorizing citizens to sue violators of the law. Several steps normally are taken to clean up a site once contamination has been discovered. Initially a remedial investigation is conducted to determine the nature and extent of the contamination. In the risk assessment phase, scientists evaluate if site contaminants might harm human health or the environment. If the risks are high, then all the various ways the site might be cleaned up are evaluated during the feasibility study. The record of decision is a public document that explains which of the alternatives presented in the feasibility study will be used to clean up a site. Usually, the most protective, lowest cost, and most feasible cleanup alternative is chosen as the preferred cleanup method. The selected cleanup method is designed and constructed during the remedial design/remedial action phase. The operations and maintenance phase then follows. Periodically the remedial action is evaluated to see if it is meeting expectations outlined in the record of decision. Abandoning the use of the aquifer and finding an alternative source of water. Several ways are available to contain groundwater contamination: physically, by using an underground barrier of clay, cement, or steel; hydraulically, by pumping wells to keep contaminants from moving past the wells; or chemically, by using a reactive substance to either immobilize or detoxify the contaminant. When buried in an aquifer, zero-valent iron (iron metal filings) can be used to turn chlorinated solvents into harmless carbon dioxide and water. The most common way of removing a full range of contaminants (including metals, volatile organic chemicals, and pesticides) from an aquifer is by capturing the pollution with groundwater extraction wells. After it has been removed from the aquifer, the contaminated water is treated above ground, and the resulting clean water is discharged back into the ground or to a river. Pump-and-treat, as this cleanup technology is known, can take a long time, but can be successful at removing the majority of contamination from an aquifer. Another way of removing volatile chemicals from groundwater is by using a process known as air sparging. Small-diameter wells are used to pump air into the aquifer. As the air moves through the aquifer, it evaporates the volatile chemicals. The contaminated air that rises to the top of the aquifer is then collected using vapor extraction wells. Bioremediation is a treatment process that uses naturally occurring microorganisms to break down some forms of contamination into less toxic or non-toxic substances. By adding nutrients or oxygen, this process can be enhanced and used to effectively clean up a contaminated aquifer. Because bioremediation relies mostly on nature, involves minimal construction or disturbance, and is comparatively inexpensive, it is becoming an increasingly popular cleanup option. Some of the newest cleanup technologies use surfactants (similar to dishwashing detergent), oxidizing solutions, steam, or hot water to remove contaminants from aquifers. These technologies have been researched for a number of years, and are just now coming into widespread use. These and other innovative technologies are most often used to increase the effectiveness of a pump-and-treat cleanup. Depending on the complexity of the aquifer and the types of contamination, some groundwater cannot be restored to a safe drinking quality. Under these circumstances, the only way to regain use of the aquifer is to treat the water at its point of use. For large water providers, this may mean installing costly treatment units consisting of special filters or evaporative towers called air strippers. Domestic well owners may need to install an expensive whole-house carbon filter or a reverse osmosis filter, depending on the type of contaminant. SEE ALSO Attenuation of Pollutants ; Chemicals from Agriculture ; Groundwater ; Landfills: Impact on Groundwater ; Legislation: Federal Water ; Modeling Groundwater Flow and Transport ; Pollution of Groundwater: Vulnerability ; Septic System Impacts . Boulding, J. Russell. Practical Handbook of Soil, Vadose Zone, and Ground-water Contamination: Assessment, Prevention, and Remediation. Boca Raton, FL: Lewis Publishers, 1995. Wiedemeier, Todd H. et al. Natural Attenuation of Fuels and Chlorinated Solvents in the Subsurface. New York: John Wiley & Sons, 1999. Johnson, Robert et al. "MTBE: To What Extent Will Past Releases Contaminate Community Supply Wells?" Environmental Science & Technology 34 no.9 (2000): 210A. <http://pubs.acs.org/hotartcl/est/2000/research/0666-00may_pankow.pdf> . "Methyl Tertiary Butyl Ether (MTBE)." U.S. Environmental Protection Agency. <http://www.epa.gov/mtbe/> . Swain, Walter. "Methyl Tertiary-Butyl Ether (MTBE)." <http://ca.water.usgs.gov/mtbe/> . "Water Pollutants." Recommended EPA Web pages. U.S. Environmental Protection Agency. <http://www.epa.gov/ebtpages/watewaterpollutants.html> . Methyl tert -butyl ether (MTBE) is used almost exclusively as a gasoline additive to help reduce harmful tailpipe emissions from motor vehicles. MTBE has been credited with improving air quality by significantly reducing carbon monoxide and ozone levels in areas where the additive has been used. Unfortunately, this is a case where the United States may have "robbed Peter to pay Paul": a growing number of studies have found that MTBE has contaminated groundwater and surface water in those same additive-use areas. As a part of their National Water Quality Assessment, the U.S. Geological Survey (USGS) found MTBE in 21 percent of 480 wells located in specific areas of the United States that use MTBE in gasoline to abate air pollution. In the rest of the United States, MTBE detection frequency in groundwater was only about 2 percent. Furthermore, after controlling for factors such as population density, commercial and industrial land use, and the presence of gasoline stations, the USGS found that the use of MTBE in gasoline increases the probability of detecting MTBE in groundwater by a factor of about 4 to 6. MTBE readily dissolves in water and can move rapidly through soils and aquifers. Because it is resistant to microbial degradation, it migrates faster and farther in the ground than other gasoline components, thus making it is more likely to contaminate public water-supply systems. According to the USGS, the vulnerability of aquifers to MTBE contamination appears to be most dependent on the chemical's use, the population density, and the presence of industry, commerce, and gasoline stations in the vicinity of sampled wells. Hydrogeologic factors such as well depth, groundwater level, and presence of roads seem to be less important. There is widespread concern about MTBE in drinking-water sources because of potential human-health effects and its offensive taste and odor. The U.S. Environmental Protection Agency has tentatively classified MTBE as a possible human carcinogen, but has not yet established a drinking-water regulation. The agency, however, has issued a drinking-water advisory of 20 to 40 micrograms per liter (20 to 40 parts per billion) on the basis of taste and odor thresholds. Although water can be treated using existing technologies such as air stripping or granular activated carbon (GAC), such treatment is difficult and time consuming because of MTBE's physical and chemical properties. Air stripping is a process in which contaminated water is passed through a large column filled with loose packing material while upward-flowing air evaporates volatile chemicals from the water. MTBE does not readily separate from water into the vapor phase, often requiring high air-to-water ratios. The GAC treatment technique pumps contaminated water through a bed of activated carbon to remove organic compounds. Since MTBE does not adsorb well to organics such as carbon, high volumes of the contaminated water must pass repeatedly through a GAC system before MTBE is effectively removed. Based on what is now known about MTBE, scientists and regulators have recommended significantly reducing or eliminating the use of MTBE in gasoline to protect drinking water. They are also recommending that safer alternatives to MTBE such as ethanol be used in gasoline to guarantee that clean air benefits are preserved.